Instagram is constantly growing and in recent years it’s fast become many people’s favourite place to hang out online. 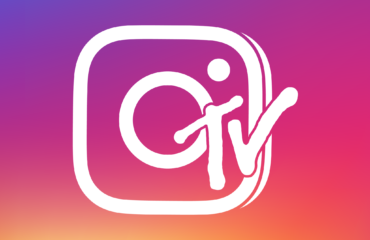 In fact, Instagram has now developed into such a huge player in the social media scene that nowadays a lot of businesses, influencers and celebrities actually depend on the platform for a huge portion, if not all of their income. That’s a huge amount of responsibility on Instagram’s shoulders. So, you can imagine the utter chaos and panic that was caused when peoples Instagram followers suddenly started to go missing. Did you lose a ton of followers in the infamous Instagram purge last week? If the answer to that question is yes, then you are certainly not alone. In fact, you are in the company of high-level influencers and A-list celebrities. Fancy that. When did the Instagram glitch happen? 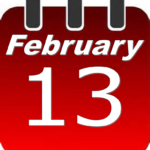 February the 13th 2019 was a sad and confusing day for many Instagram users across the globe, who awoke to find a drastic reduction in their follower counts. Gasp! Large numbers of followers simply began disappearing without a trace, and for the most part no one seemed to know for sure what was going on. Who was affected by the Instagram Glitch? Lots of different people were affected. The Instagram glitch on Feb 13th 2019 did not affect or target a specific group of people. There are some people who believe that it was meant to target fake accounts but this is just a rumour, and simply isn’t true as even Instagram themselves were affected! The fact is that lots of people from a variety of different backgrounds and with varying levels of influence were equally affected by the glitch. This is exactly what you would expect from a genuine problem down at Instagram HQ. How did people react to the Instagram glitch and how did it affect them? Now, you’d be forgiven for thinking that the loss of 30 or 40 followers isn’t that big of a deal, but consider for a moment all of the hard work that goes into acquiring a single follower and you begin to understand why even those people who only lost a few of their followers were so upset to find that some of their followers had gone missing. All of their hard work attracting and gathering followers was simply evaporating into thin air right before their very eyes! Besides, some folks lost a whole lot more followers than that. Losing half a million followers is obviously devastating. As I’m sure you are aware, any significant loss in followers can severely damage your engagement levels, reach, visibility and influence on the platform. This is really bad news if you depend on Instagram for your livelihood. Remember at the beginning of this article when I said that you were in the company of A-list celebrities? Well, that’s because hugely popular celebrities like Ariana Grande, the Kardashians and Selena Gomez also reportedly lost several million followers between them on Feb 13th. Heck, even Instagram themselves took a huge hit when they lost over 3 million followers on their account overnight. So what the heck was going on? Why were so many people from so many different levels and backgrounds all experiencing such severe losses? This leads us nicely onto the next question. Did the Instagram glitch have anything to do with clamping down on fake accounts? 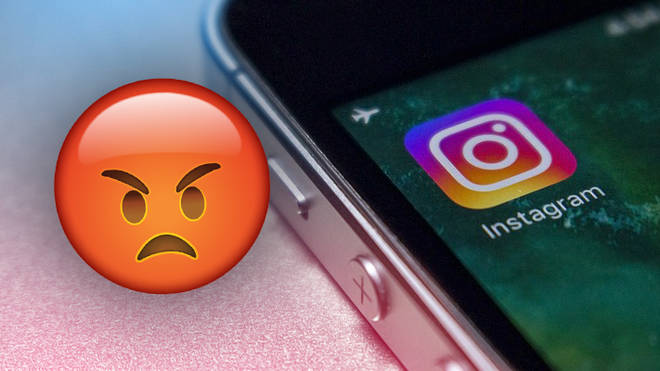 After the glitch happened, it wasn’t long before all manner of folks started to suggest their theories, the main one being that Instagram was clamping down on fake and inactive accounts. “Since the early days of Instagram, we have auto-detected and removed fake accounts to protect our community. Today’s update as another step in keeping Instagram a vibrant community where people can connect with the people and things they love”. 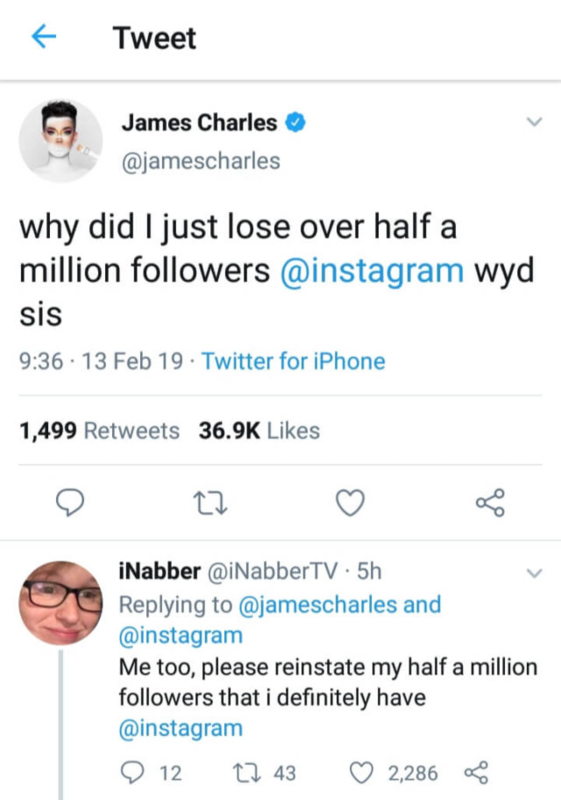 Given this admission, it’s understandable that when their followers started disappearing, many people automatically assumed that the loss in followers was some kind of purge on Instagram’s part. But if you think about it, that doesn’t explain why top celebrities and even Instagram themselves were affected. They have since acknowledged that the loss of followers was not a part of some kind of “cull” or “purge” at all, but rather that it was in fact caused by a glitch in the system which thankfully now seems to have been largely sorted out. So is the Instagram Glitch all fixed now? It has now been almost a week since the glitch first occurred and it does seem that the bug has been fixed, but only the folks at Instagram know for sure what’s going on. We do know that in the last few days, many people have reported that some or all of their missing followers have now reappeared, like Kensington Palace, who recovered 150k followers on Valentine’s day. But there are still quite a few people who are having issues as Instagram continues to iron out the kinks. Unfortunately, it seems that the glitch may also have had a knock-on effect for some Instagram users. So here at Buy Social Media Marketing, we are advising all of our clients to check their Instagram accounts thoroughly for any anomalies. What sort of anomalies should you look for on your Instagram account if you have been affected by a loss of followers? 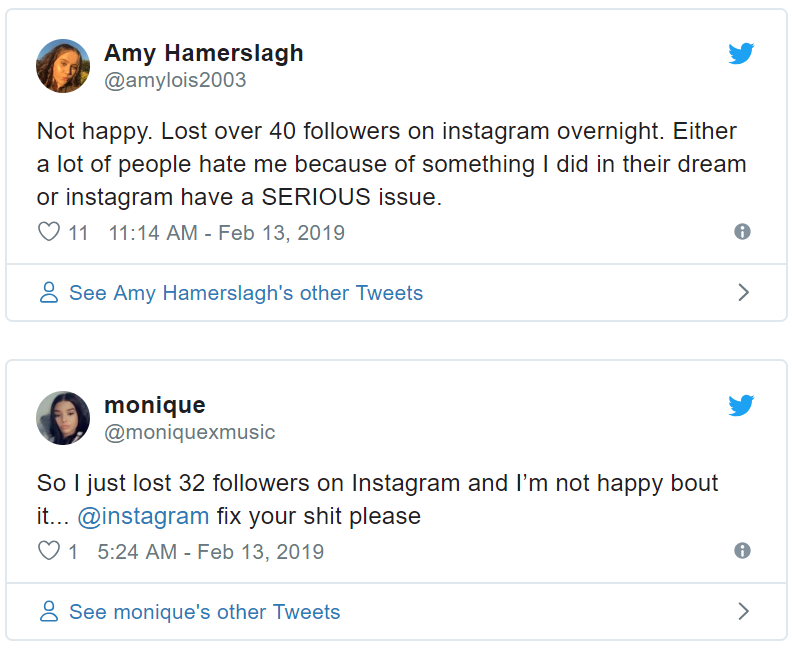 If your Instagram account has been affected by the glitch that happened on February the 13th 2019, you’ll probably want to take a closer look at your account and check that everything is working exactly as it should be. Firstly, there have been a significant number of people reporting that it is impossible to follow back on affected accounts for instance. Others have complained about login issues, not being able to like or leave comments on posts, likes being registered as unlikes, posts been taken down, and captions been deleted in the aftermath of the glitch. We are not sure just how widespread these problems are, but they do seem to be related to the main issue which was caused by the Instagram glitch on the 13th of February. Instagram is aware of all of these related issues and is working hard to get things back to normal. We expect that the above issues will be fixed very soon. Some of our customers have had success in solving some of the issues they were having simply by updating their Instagram apps. If you haven’t already tried this, then please have a go at updating the app just to see if this solves any minor Instagram issues or problems you may be experiencing. If you have already updated the app and you are still having issues with your follower count then please feel free to get in touch with us and we will help you out. I lost some of the followers I bought from BuySocialMediaMarketing because of the glitch, will you replace them? BuySocialMediaMarketing customers who have experienced a loss of followers due to this unfortunate glitch are advised to contact us directly to discuss replacement of lost followers. We will be happy to replace all of the missing followers in cases where our clients are covered by our 60-day replacement guarantee. If you have never bought before, you can find our Instagram followers packages by clicking here, they start from $2.99. Our customers should also be advised that there are several fake news stories and posts currently circulating about the Instagram glitch. These are mainly clickbait type articles or Instagram and Twitter posts like this one that are designed to get the person who posts them more engagement or else scare Instagram users into thinking that their account is in danger of being taken down or deleted. This is not the case, however, and there is absolutely no need to worry about these fake messages whatsoever. Final thoughts on the glitch. It seems that the initial panic caused by the Instagram glitch was completely unnecessary. It has now been confirmed by Instagram that rather than being a crackdown on fake accounts, the glitch was simply that, just a glitch in the system that Instagram has now fixed. Even though some people are still experiencing minor issues with their Instagram accounts such as those outlined above, it seems that the trouble has passed and things on Instagram are slowly but surely returning back to normal.